Eldorado, whilst being renowned in the past as a traditional Leyland operator, had never been afraid to experiment with other makes in their quest to ensure that they had the right fleet for their needs. In the early 50's they tried AEC Regent IIIs, in 1960 bought a solitary Daimler Fleetline before settling on the Leyland Atlantean as the standard rear engined double decker, and in 1964 even bought a pair of new Routemasters. In 1970 came a Bristol VRT, which remained another one-off, and in 1981 bought their one and only new Metrobus, a Mk 1 (110 - see Oddballs), before settling on the Olympian as the standard second generation rear-engined double decker. Although it remained a one-off, this one new Metrobus, like the Regents, Fleetline, Routemasters and VRT before it, was not prematurely withdrawn, but led a full service life - in this case nearly 19 years. 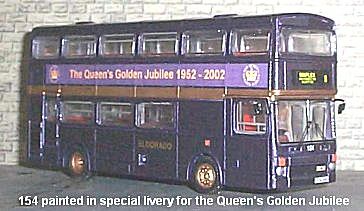 After the end of Olympian production, there was a need to find a new "standard" double decker. 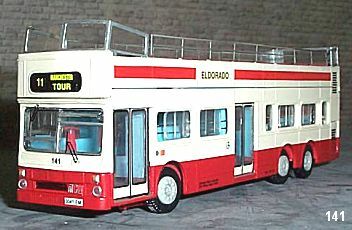 While the rest of the country was looking towards low-floor vehicles, Eldorado bought the first secondhand Mk 2 Metrobus (150) in 1999, from Town & Country, overlapping the end of Mk 1 110's career by just 4 months. It was in such good condition that it entered service in its previous owner's livery of all-over red (fortunately the same shade as Eldorado's own red), and as yet, has not needed a re-paint. Whilst the first two, acquired direct from their previous owners, retain their original registrations, the latter five were bought from a dealer, and have been re-registered with registrations that match their fleet numbers - a practice now rendered obsolete by the new registration numbering scheme! Two years after the acquisition of the last Metrobus, this monster was acquired. Formerly with China Motor Bus, this three-axle vehicle was brought back to the UK, fitted with a full-width front entrance and converted to open top. Withdrawal of the Mk 2 Metrobuses started in May 2005, when the first two were replaced by new Scania Omnidekkas, with the last four closed-top examples being replaced by secondhand Scanias in March 2007. The final Metrobus, open-top 141, was withdrawn in June 2007.